During the year the city of Málaga and its surroundings hold a great variety of traditional popular festivals, both religious and cultural. Many of them are well known all over the world, like the August fair or Holy Week at Easter, and are visited by millions of people every year. 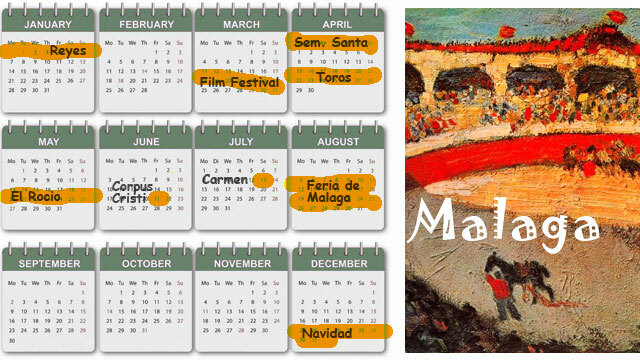 The Málaga Film Festival, which is held in April, is a celebration of the best of the year's Spanish language films, with screenings of films from Spain and Latin America, including shorts and documentaries, at the Cervantes Theatre in Calle Ramón Marín, with an award (the Biznaga de Oro) for the best film, and other events including discussions of topics about Spanish cinema. The bullfighting season runs from April to September, with Semana Santa and the August Fair being the highlights. This is unusual in Spain, as August is usually considered too hot. Semana Santa, or Holy Week (the week leading up to Easter) is probably the most important religious holidays in Spain. Images of the Christ and the Virgin are paraded through the streets on enormous floats or “thrones”, accompanied by Nazarenos and Penitentes in robes and pointed hoods. The smell of incense and the unique sound of the music of Semana Santa fill the air. The Romería de El Rocío is a famous pilgrimage that takes place 50 days after Easter in the Province of Huelva. Málaga is just one of around twenty starting points for the pilgrimage, during which thousands of people make their way to the Paloma Blanca Shrine in the village of El Rocío, 17 kilometres from the town of Almonte. The pilgrim brotherhoods usually arrive in the village of El Rocío on horseback, by carriage or on foot, dressed in flamenco clothing. On Saturday there is a parade, where the pilgrims present their simpecado before the statue of the Virgin Mary, while the church bells ring. On Sunday there are various religious acts, of which the most important is the “jumping the fence”, when the people of Almonte jump over the fence around the shrine to bring out the statue of the Virgin and parade it around the village. During the night, in an atmosphere similar to Seville’s Feria de Abril, the local people and the pilgrims come together in their “casetas” with live music, dancing, food and drink into the early hours. The religious festival of Corpus Christi celebrates the Eucharist. The main event is a procession in which a float with a sculpture of the sacrament is carried along Calle Larios and Calle Granada, past shrines and altars erected for the occasion. The Fiesta del Carmen is of particular importance in Málaga city and the surrounding towns and villages with a maritime tradition. She is the patron saint of seafarers and the festival dates back to when the main source of revenue in the area was the fishing industry, and as part of the festivities a statue of Our Lady Carmen is carried through all the fishing districts in the evening by bearers dressed in the traditional marengo costume of white shirt, black trousers, a red cummerbund and canvas espadrilles. Afterwards they take off their shoes and wade out to sea, carefully placing the statue on a fishing boat adorned with flowers. It is then taken out to sea, followed by a multitude of small jábegas (fishing boats). There is music and cheering, singing and dancing as well as a fireworks display. The August Fair lasts nine days, starting just before midnight on a Friday and finishing on a Sunday night. The date commemorates the fall of the city to the Christians on August 18, 1487. The Real de la Feria in the Cortijo de Torres district in the west of the city is the centre of night time activities. During the day people converge on the city centre, which is decorated with paper lanterns and floral displays. Booths are set up, and there are performances for children, and much singing and dancing (especially of verdiales, the local variant of flamenco). You can also watch bullfighting every afternoon. Malaga is said to have the best Christmas lights in Spain, and its easy to believe when you see the city centre lit up all the way from the Plaza de la Constitución to the sea front and along the Alameda, with a traditional Belén, or nativity scene at the bottom of Calle Larios, and the three kings riding their camels over the entrance to the tunnel under the Alcazaba. Taking advantage of its seaside location, Malaga's Three Kings Parade on the evening of January 5th has them arriving by boat before being carried around the city on their thrones while enthusiastic helpers throw sweets to the children. This is one of the happiest and most colourful festivals, and although enjoyed by young and old alike, its a very special occasion for children in particular, who receive their presents the following morning.